This entry was posted in Brexit, Socialist Party and tagged Brexit, Socialist Party by irishmarxism. Bookmark the permalink. Good article. On another completely unrelated topic, can I suggest, in the most comradely way possible, that your header image conveys an archaically (Stalinist even?) sexist image of the relationship between men and women. Why not alter it so that the man is holding the baby, the two adults are of equal height, and the woman gets to grasp the pole/implement/ whatever it is on the left hand side. As Mao said: “Women hold up half the sky” – why not illustrate that? On your suggestion for the header image. 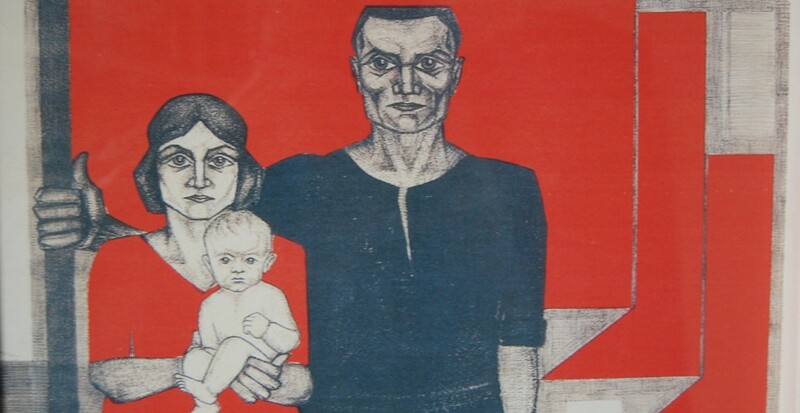 It is a photograph of a Dutch socialist poster I bought in the trade union museum in Amsterdam some years ago and as far as I know is not of Stalinist origin. It is easy to see how it can be seen as sexist, as you say – the woman is holding the baby. We could go even further and suggest it is a representation of a nuclear family which assumes a male and a female relationship, excluding gay or lesbian relationships. However, it is of its time, and I think progressive in that sense. I liked it because it included a woman standing for the red flag of socialism with the same facial determination as the man and in this way equal. Even the baby has the same determined look that I liked. The singularity of expression denotes an equality that I think the image conveys. So while accepting that the image can easily be seen as sexist, I don’t think it is quite so straight forward, for example I don’t think that the woman being of lesser height means she is presented as less important. Would the image be better if the man was carrying the baby and the woman was holding the flag? Of course. Unfortunately I don’t have the IT skills to make the changes you suggest (let me know if you do!). I was thinking of changing the image since it has been used for some time but I would be reluctant to see it as unacceptable. Not all images of socialism require a comprehensive depiction of the unity of the working class and the oppressed that it encompasses.